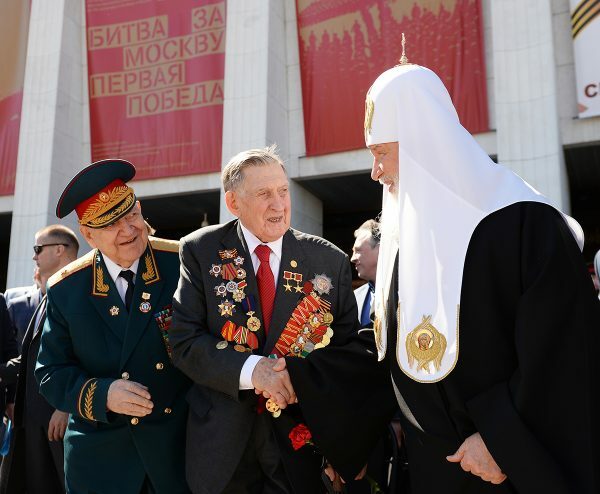 Moscow, May 8, Interfax - The victory in the Great Patriotic war was gained with participation of heavenly protectors, Patriarch Kirill of Moscow and All Russia believes. “Final shells of the Great Patriotic war were heard on the feast of St. George (on May 6, 1945, which coincided with the Easter – IF). Is it a coincidence? Someone thinks it is, but we, people of the faith, don’t think so. Is it a coincidence that the name of the victory’s marshal was Georgy Konstantinovich Zhukov?” the patriarch said after the service celebrated on St. George Day at St. George Church on Poklonnaya Hill in Moscow. “Today we pray to St. George so that he would save our Motherland from outside and internal enemies, protect Moscow, strengthen faith of its citizens and Moscow would become the throned city not only by its name, but also by the faith of people living in it,” the patriarch said.